This boneless leg ham is made from quality selected legs of pork, cured and naturally wood smoked to our old family recipe. Delicate flavours to tantalize the taste buds. This ham is as moist and succulent as ham on the bone. Trust us, we know! Traditionally cured and naturally wood smoked, this lean, boneless, skin on leg ham has the unmistakable subtle flavours of our flagship ham. An excellent ham for any occasion. 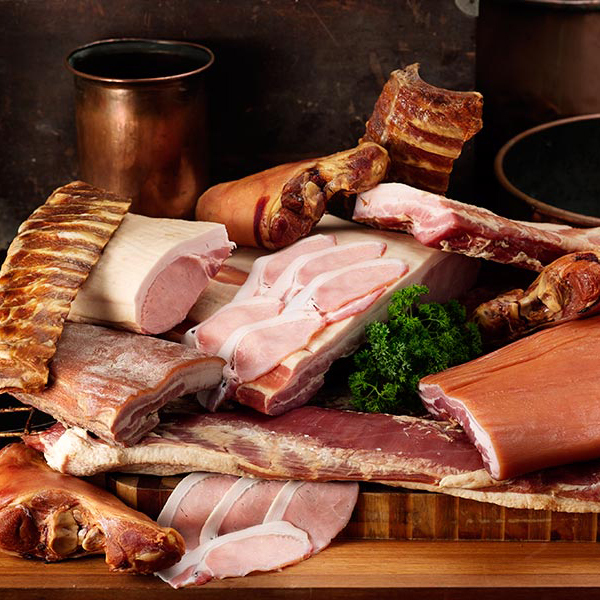 Only carefully selected Australian legs of pork with the right depth of fat are chosen for this premium leg ham. Our master craftsman takes great care in tunnel boning and hand curing this award winning ham. Traditionally wood smoked, cooked and uniquely shaped to allow for ease of carving. A premium quality ham made from the finest Australia pork leg. Traditional Bavarian style hand cured, rolled and let sit for 48 hours before applying natural wood smoke to achieve a distinctive dark colour. Rindless rashers of lean pork belly. The Cartilage bones are removed. 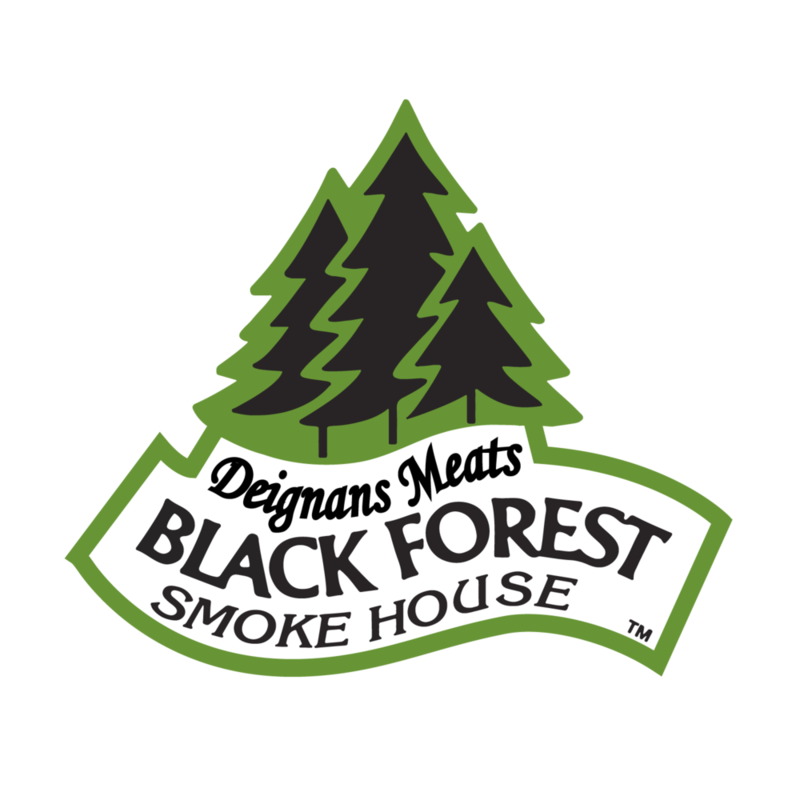 Natural wood smoked, made with that Black Forest love! Cured pork belly, skinless, boneless, smoked and cooked. Serve hot or cold thinly sliced, it's your choice! An Austrian classic. Premium Pork belly, boneless, skin on, and dry salted and cold smoked over a number of days then air dried. Serve thinly sliced with rye bread or chop and fry as a topping over Caesar salad. Premium Australian pork loins. Rindless rashers, natural wood smoked. Consisting of the loin (eye) and 2-5cm of the belly (tail). Skinless, boneless cured pork loin. Smoked and cooked. Serve thinly sliced or reheat and serve with sauerkraut etc. Middles are cured & marinated in traditional family recipe for over 48 hours, hung to dry, naturally wood smoked and slowly cooked. Short or imperfect rashers of English or American bacon. Suitable for frying or chopping when cost is #1 consideration. Boneless pork belly, skin on, dry salted and air dried. Serve it thinly sliced, or cook and crumble on Caesar salads. A revolution in bacon for breakfast. 94% lean. Naturally wood smoked. We know what we are doing! A fine emulsion with traditional German Flavours from Berlin. Continental lyoner garnished with pork fillet pieces, white peppercorns, parsley and spices. A Swiss/German style meatloaf of finely chopped pork. Serve cold thinly sliced or cut thicker and grill. Continental lyoner garnished with diced red and green capsicum. Italian style cooked sausage made with a smooth emulsion of pork and veal, pieces of pork backfat and studded with pistachio nuts. Sourced from premium grain fed Queensland beef. This specialty product is sought after around the country especially from some of Sydney's finest chefs. Eye round of beef marinated and covered with fresh spices and slow baked. Strips of lean pork marinated "Chinese style" with special spices and wine then oven roasted. Serve thinly sliced in fried rice or grill in small pieces and serve hot. Continental lyoner garnished with various mushrooms and leeks. Oven Roasted. Boneless turkey half breast. Grain fed eye fillets of beef silverside, marinated in an old family recipe and slowly cooked in a flavoursome stock, juicy and tender. Grain fed eye fillets of beef silverside marinated, smoked and cooked. Made to authentic American recipe. Coated in a variety of coriander and peppers. Serve on rye bread with Swiss cheese, sauerkraut and dill pickles. An authentic European home style sausage salami, made from cured pork infused with aromatic herbs and spices. Italian style salami with coarsely ground pork and pork fat, spices and wine. Filled into Ox bungs 90mm diameter x 40cm long. Mild Danish style prepared with pork, selected spices and wine. 90mm diameter x 50cm long. Hot Italian style salami with medium ground pork, hot paprika, spices and wine. 70mm diameter x 50cm long. Andalusia style salami prepared with coarse ground pork, hot paprika and other spices. Medium heat. 90mm diameter x 50cm long. A medium grind, mild flavoured Italian style salami. 70mm diameter x 50cm long. Coarse ground pork in a fine emulsion. Seasoned with spices and a touch of garlic. Linked 35cm in 22mm red coloured casings, smoked and cooked. Typically a short fat sausage with zesty seasoning and a smokey after flavour. A coarsely ground pork sausage "Italian style". Seasoned with paprika, garlic and spices. Ideal for grilling, pizza topping etc. A specialty from Spain/Mexico. Seasoned with paprika, chilli and various spices which give this sausage a rich red colour. Coarse beef sausages with traditional spices, double hot smoked. A fine emulsion of yearling beef, veal and pork. Lightly seasoned filled into artificial red collagen casings and double smoked. 12 Frankfurt's per kilo. "A mini taste sensation" Coarse pork sausages with chunks of cheese, special spices, double hot smoked. Fantastic if grilled and served hot. A fine emulsion of yearling beef and veal with pork is used to make this continental flavoured sausage, filled in natural casings, double smoked & cooked. "A taste sensation" Coarse pork sausages with chunks of cheese, special spices, double hot smoked. Fantastic if grilled and served hot. A fine emulsion of pork, authentic swiss flavour with delicious granny smith apple. A course blend of lean pink veal and spices, with a slight hint of brandy and fresh chives. Black sausage: known as "Black Pudding" in Britain, in France as "Boudin Noir" and in Hungary as "Hurka". Linked in 15cm lengths in 28mm casings. Serve Hot: boiled, grilled or fried. A traditional Irish white sausage mixture of sage, parsley and a peppery after note. Serve hot: boiled, grilled or fried. Duck meat coarsely ground, seasoned with spices and flavoured with orange liqueur. A medium coarse blend of pork infused with a hint of chilli, mixed with tasty cheese. Coarse blend with traditional flavours including pepper, coriander, nutmeg, mustard with a hint of lemon.